The First Tomato: Let's Celebrate! 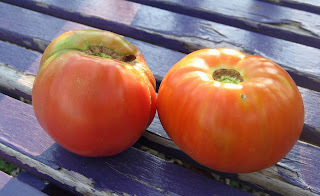 For just a moment this evening, the gardening world stopped, at least here at May Dreams Gardens, as I found not one, but two big ripe tomatoes in my garden. I declared it a tie between ‘German Johnson’ on the left and ‘Beefmaster’ on the right for the honor of being The First Big Ripe Tomato of 2008. It was a rare double-play in the garden, a cause for great celebration. I celebrated by eating both of them. In all the excitement, I completely dispensed with the original Ritual of the First Tomato and just ate them both. I ate the ‘Beefmaster’ like an apple, but the ‘German Johnson’ had a few spots on it, so I cut it into chunks and ate it a piece at a time. I shared with no one. The gardener who did all the work, who selected the varieties, sowed the seeds, nurtured the seedlings, planted them out in the garden, carefully tied them up and pinched out the suckers, has all rights and privileges related to the first tomatoes and can eat them how she wants, when she wants and even if she wants. The celebration belongs to the gardener! And here at May Dreams Gardens, that celebration belongs to me! Yes, they were delicious! Juicy! Tomato-ey! Ripe! Warm! They were all I had hoped for, worth every drop of sweat put into growing them, every moment of waiting for them. I like to celebrate events of the garden. I’ve celebrated the first crocus, the first lawn mowing of spring, the first lilacs, the first peonies, triumph with peas, victory over the rabbits with beans, the blooming of the night bloomer, and of course, the first tomato. But the best celebration is always the first tomato. Always. What do you celebrate in your garden? We plant a zinnia patch outside the kitchen window. When they reach soaring 3foot height, it's time to celebrate! For the rest of the summer, washing the dishes comes with a happy, colorful view, esp when the finches and monarchs visit. Congrats! I told you you'd get yours soon. Sign me ... the guy who harvested his first "Yellow Boy" yesterday. It made an awesome caprese. Congratulations on your first tomatoes Carol! The first tomatoes are definitely a high point of summer, at least they always were for me. They rarely made it into the house, and like you, as the gardener, I always reserved first rights on first tomatoes! Did they taste as good as previous years? Mine tasted better this year! I'm going to grow German Johnson and Better Boys next year cause I think they taste the best. So congrats and stock up on craft Mayo. I got to have lots of mayo with my maters. My little cherry tomatoes are starting to ripen, I've eaten one already. That doesn't even really count as a tomato. I'm hoping my mom and dad will bring me some real tomatoes from their garden when they visit next week. I'm like Anna, some fresh white bread and mayo makes a delicious tomato sandwich. It is definitely good eats to a southern gal. How yummy. I'm glad you enjoyed them all by yourself. You deserve them, little red hen. What a great photo of your tomatoes. I also appreciate the photo of the cereus in your post below - I just read about them in the book 'Bean Trees' by Barbara Kingsolver. I stumbled on your blog while googling "home depot tree prices" and you were a link on someone else's page. It's always fun to blog surf. Thanks for sharing your gardening and photos. What a charming blog. So glad I found it. I celebrate rain snd anything that survives our hot, dry, windy smmers, particularly if you can eat it or sniff it's delicious scent. I go nuts over any spring bulb that survives and promises to bloom. There is nothing like a sun warm tomato from the vine, except perhaps a strawberry. Happy gardening. Congratulations Carol on your not one but two "First Tomatoes of Summer". I would celebrate rain if we had any right now. Congratulations on your first tomatoes. Here, the ambition is to have ripe tomatoes for Christmas. I have a couple of seedlings -- they're just up and only have their false leaves ATM. I celebrate the sprouting of vegetable seeds, as well as first sightings of my favourite plants -- I have a recent post about wattle, for example. The first one of everything in the garden always calls for a celebration. The first tomato is definitely cause for celebration! I can't believe I actually bested you in one thing, Carol--I picked my first large ripe tomatoes last week. But I won't gloat--my tomato vines are wilting, and I'm worried the bumper crop I'd expected will be dying by the end of the month. I planted varieties that were fungus-resistant, but I'm wondering if all the heavy rains we've had had something to do with it. But we will enjoy the tomatoes while they last! Like the other Texas gardeners, I celebrate rain each and every time it graces my corner of Katy. My favorite celebration, though, is the day I feel the first breath of fall and know that the misery of summer is almost over! Yesterday I celebrated when I saw my first EVER bell pepper growing! I've never grown a bell before, only ever gotten them at the store, and to see one so small, but growing bigger every day, is just amazing. I love gardening. I see that Pam/Digging beat me to the "little red hen" reference. Indeed the one who does the work should reap the benefits. (Not like that stupid grasshopper and ant fable). I'm happy for your pleasure. Thanks for sharing. Oops. Forget to answer your question. I celebrate the first rain of fall, the first norther, oxblood lily day, the Mexican plums blooming, the annual return of my own Asiatic lily, and the first Tulipa clusiana. I also tend to get pretty excited about snow in those rare years when we have some. But the biggest celebration is for the bluebonnets. I'm sorry you didn't get to see them in a good year. Finally! The earth can now continue revolving! I bet it was a delicious meal! I celebrate the first spring beauty (claytonia virginiana) and the first of any plant I planted the fall before. Now that I think about it, I celebrate the whole first month of spring. I celebrate every day I get to spend out there. Truly. That one paragraph sounded like The Little Red Hen, BTW. Congratulations. I had a Mortgage Lifter and a Beefmaster the other day. They made my taste buds sing. Thanks all for the comments. I think we gardeners celebrate more than any other type of "hobbyist" I know of. Let's celebrate that!